I. N. Phelps Stokes, The Iconography of Manhattan Island, Volume 1, PL 10A-b. Retrieved from www.archive.org. 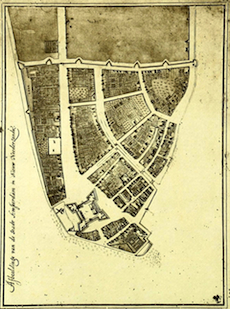 The Castello Plan is the most detailed map of New Amsterdam during the Dutch period, depicting the settlement in 1660. Copied many times through history, the original by the cartographer Jacques Cortelyou was commissioned by the burgomasters to send to the directors of the Dutch West India Company in Amsterdam. Open spaces of orchards and gardens featured prominently, as lot owners resisted building upon their property until land values rose. This posed a problem for the growing population of the settlement that had almost doubled to 1,500 inhabitants by the end of the 1650s. In response to the Cortelyou missive, the directors expressed discontent with the paucity of buildings in the small town, which they envisioned developing into a major port. The map shows the settlement focused on the East River, with the large fort occupying the site that became Bowling Green, at the head of Broadway. The main canal, today's Broad Street, has a shorter offshoot to the west along present-day Beaver Street. At the eastern edge is Pearl Street, home to many handsome homes and warehouses of wealthy merchants. At the north end of the settlement is a nascent Wall Street, demarked by the protective wall. Colonial inhabitants of New Amsterdam feared invasion from New Englanders, but a treaty between the global powers kept them safe until 1664, when the British would capture the settlement and rename it New York.